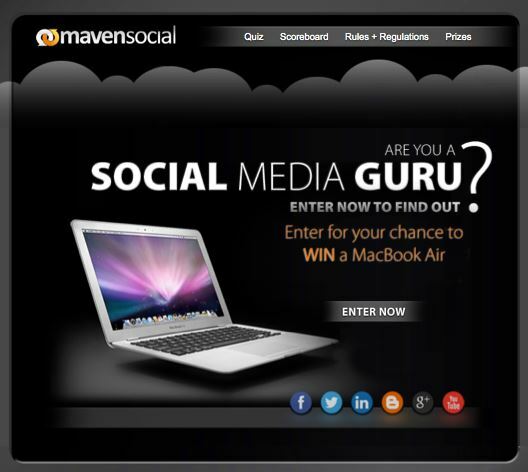 Answer our quiz questions to find out if you are a Social Media Guru. Compete against your friends to win an 11″ Macbook Air. Click HERE to enter the contest. Contests, campaigns and interactive quizzes are a great way to get your brand noticed, drive traffic to your website and generate followers. Having these types of marketing strategies is smart due to the largely growing social media age that we are living in. Social media is a crucial part of marketing your brand. If you are not getting the traffic you want to your website, or your sales have been steadily low, maybe your lack of online presence is the problem. Using social media outlets to your advantage will make the difference between what you have now, and what you could have; a larger following, a larger profit, and larger recognition.